Read 200 Hundred Case Study Reviews and Testimonials from Cat Owners Around the World for our Certified Cat Behaviorist, Mieshelle Nagelschneider. Founder and director of The Cat Behavior Clinic and acclaimed New York Times feline behavior science author, learn more about Mieshelle’s past and current animal behavior and animal welfare studies through the Oxford University, University of Edinburgh – The Royal School of Veterinary Studies, upcoming at Oxford University, and read more about her experience at Yale and Harvard University. 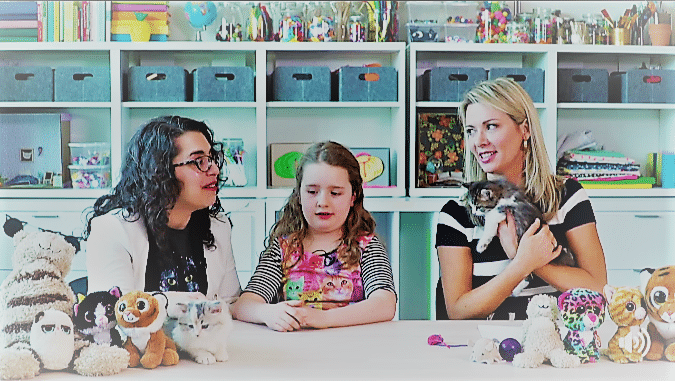 She lectures to veterinarians internationally from Toronto to the Philippines and has been solving cat behavior issues with the clinic nationally and internationally since 1999. Help your cat(s) with an issue that you probably didn’t realize has turned into a complex one. Schedule a phone or video Skype consultation. Or visit our clinic main homepage. 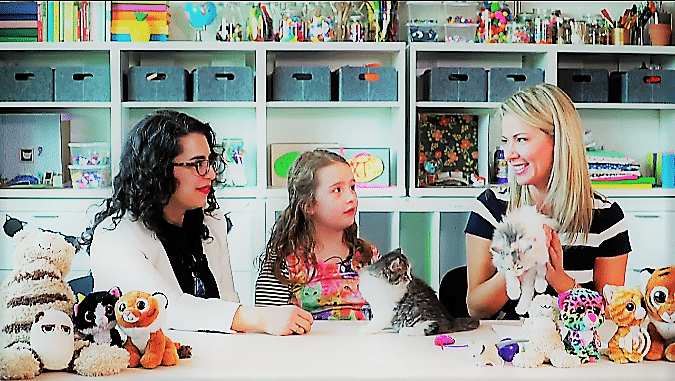 PARENT MAGAZINE: Toronto Media Tour for Arm & Hammer Cat Litter – Mieshelle as their International Spokesperson and Cat Behaviorist. Effective cat training is straight forward, but cats have a very different evolutionary biology than dogs and external and internal factors affect them differently than other species and this needs to be part of any training to change a cat’s behavior. Once I teach my clients how a cat’s mind works, they’re able to cure behavior problems in the cat who inspired them to schedule a remote phone or video consultation program with me and The Cat Behavior Clinic. More importantly, a cat trainer can prevent future problems in that cat, other cats in the household, cats they may own many years later, and even cats not yet living in the home. I educate my clients to help themselves and their cats. I know that every time I explain cat behavior to a cat owner, I’m adding to the level of cat happiness in the world and saving a cat’s life at the same time from being sent to a shelter, put outside or euthanized. If you have cat behavior problems, let me show you how to train cats to do what you’d rather have them do, and to stop doing what you don’t like. I’ve trained veterinarians and shelter workers nationally and internationally traveling the globe from Australia to the Philippines working with Best Friends Animal Society, Animal Welfare League with Whiskas, Arm & Hammer, Comfort Zone, the Paw Project, and NKLA. I’ve trained all kinds of animals, but effective cat training is easy for me, and I can convey this training to you as I have to thousands of cat lovers everywhere. Effective strategies go beyond the obvious and are more involved that what you’ll usually find on the internet. Please know that cat training is not like dog training. There is no intense hands-on approach with teaching your cat how to “behave”. Again, it’s more scientific relating to their feline evolutionary biology and how that causes them to relate and respond to the environment around them. Cats have more of an innate wildness to them which also plays a role with some behavior issues owners may be tackling. 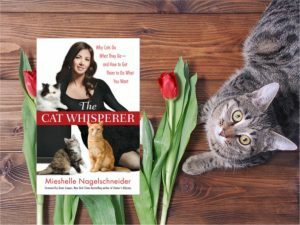 FEATURED IN THE NEW YORK TIMES: The Cat Whisperer book by Mieshelle Nagelschneider. Her book is required curriculum for a number of certifying behavior and training organizations. Think You’ve Tried Everything to Train Your Cat? I’m Pretty Sure You Haven’t. I also suggest that you read my cat behavior book published by Random House Publishing (with co-writer Cameron Powell), The Cat Whisperer. This is the first feline science book that is scholarly-cited for cat owners.